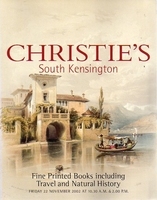 CHRISTIE, S, Fine printed books including Travel and Natural History, London 2002. Auction catalogue 22 November, 2002[sale: 9515]. Soft cover 27 x 21 cm. 158 pages with 487 lots.